There's a new addition to the family tree: an extinct species of human that's been found in the Philippines. It's known as Homo luzonensis, after the site of its discovery on the country's largest island Luzon. One of these species was the diminutive "Hobbit" - Homo floresiensis - which survived on the Indonesian island of Flores until 50,000 years ago. Prof Chris Stringer, from London's Natural History Museum, commented: "After the remarkable finds of the diminutive Homo floresiensis were published in 2004, I said that the experiment in human evolution conducted on Flores could have been repeated on many of the other islands in the region. "That speculation has seemingly been confirmed on the island of Luzon... nearly 3,000km away." The new specimens from Callao Cave, in the north of Luzon, are described in the journal Nature. They have been dated to between 67,000 years and 50,000 years ago. They consist of thirteen remains - teeth, hand and foot bones, as well as part of a femur - that belong to at least three adult and juvenile individuals. They have been recovered in excavations at the cave since 2007. Homo luzonensis has some physical similarities to recent humans, but in other features hark back to the australopithecines, upright-walking ape-like creatures that lived in Africa between two and four million years ago, as well as very early members of the genus Homo. 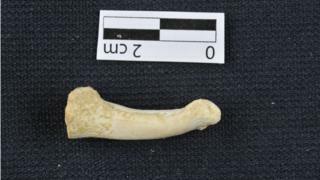 The finger and toe bones are curved, suggesting climbing was still an important activity for this species. This also seems to have been the case for some australopithecines. If australopithecine-like species were able to reach South-East Asia, it would change the way our ideas about who in our human family tree left Africa first. Homo erectus has long thought to have been the first member of our direct line to leave the African homeland - around 1.9 million years ago. And given that Luzon was only ever accessible by sea, the find raises questions about how pre-human species might have reached the island. In addition to Homo luzonensis, island South-East Asia also appears to have been home to another human species called the Denisovans, who appear to have interbred with early modern humans (Homo sapiens) when they arrived in the region. This evidence comes from analysis of DNA, as no known Denisovan fossils have been found in the region. The Indonesian island of Flores was home to a species called Homo floresiensis, nicknamed The Hobbits because of their small stature. They are thought to have survived there from at least 100,000 years ago until 50,000 years ago - potentially overlapping with the arrival of modern humans. Interestingly, scientists have also argued that Homo floresiensis shows physical features that are reminiscent of those found in australopithecines. But other researchers have argued that the Hobbits were descended from Homo erectus but that some of their anatomy reverted to a more primitive state. In an article published in Nature, Matthew Tocheri from Lakehead University in Canada, who was not involved with the research, commented: "Explaining the many similarities that H. floresiensis and H. luzonensis share with early Homo species and australopiths as independently acquired reversals to a more ancestral-like hominin anatomy, owing to evolution in isolated island settings, seems like a stretch of coincidence too far."